St Gregory's Minster: interior looking east, viewed from the ground floor of the bell-tower through the originally external Anglo-Saxon west doorway. Photograph 16 November 2011, petelovespurple, DSC3191; https://www.flickr.com/photos/36451417@N02/30971375646, by courtesy (Creative Commons). 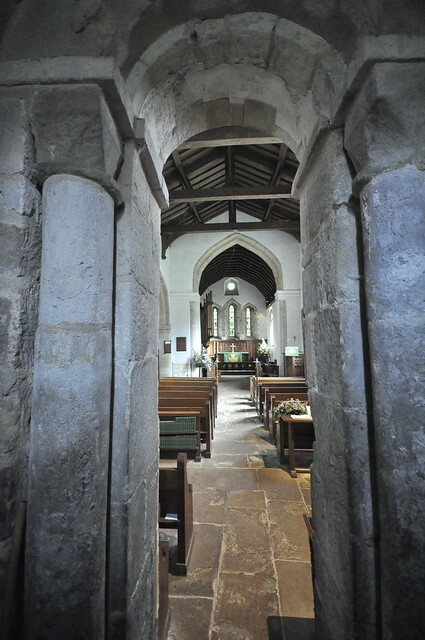 Through this tall narrow portal, we may assume that Orm Gamalson - descendant, perhaps, of vikings, owner of Kirkdale and considerable other estates in Yorkshire - preceded by his clergy and an officiating bishop, with the processional cross raised before them, entered his church, rebuilt from a ruin on its ancient foundations and now freshly reconsecrated, probably on the feast day of Gregory the Great, at some date between 1055-1065. The record of the first named Friend of St Gregory's Minster, on the Anglo-Saxon sundial, c.1060. With a grant from The Friends, the sundial built into the exterior wall above the south-west doorway was recently (January 2018) cleaned of the algae which obscures the engraved lettering shown in the above photograph, and various steps are under consideration for improving the microclimate around it. A discussion of Orm Gamalson's sundial within its 11th-century cultural context (originally delivered as the 1997 Kirkdale Lecture) is published in the Kirkdale Monographs series (listed under The Kirkdale Lecture in the menu on the left). “The Friends of St Gregory’s Minster” is a charity registered with the Charity Commission, Charity Number 700344. Our Patrons: Dr Francis Jackson CBE; The Rt. Revd. Fr. Cuthbert Madden, Abbot of Ampleforth; Professor Emeritus Gordon Leff, University of York. "The primary objects of The Friends shall be to co-operate with the Joint Church Council of the Ecclesiastical Parish of Kirkdale and St Hilda’s in the preservation and maintenance of the fabric and curtilage of St Gregory’s Minster including the provision of utility services thereto and such other facilities there for the benefit of the congregation and visitors as may be requisite from time to time and secondly to promote public education in the building, its history and its work, and for all these purposes to seek to bring together all those who have a common interest and regard for this ancient Minster." If you would like to associate yourself with this ancient church in its beautiful setting in Kirkdale, to join in community with others who help make known its history and its distinctive charisma, and maintain its fabric outside and within, in order to preserve it for future generations, please consider becoming a Friend of St Gregory's Minster - wherever, near or far, you live - and so be kept in touch with a community and a fellowship dedicated to these aims. For a fuller account of 'Friendship', and for current subscription rates, please go to Membership Information. You may also browse in News & Newsletters where news items relevant to The Friends appear. St Gregory's Minster needs your support. We would be grateful for the solidarity of your 'Friendship' with those of us who are already committed to this custodianship of one of England's most ancient churches which, we believe, has served its community continuously since Orm's restoration of it, c. 1060, and continues to do so today. The Friends of St Gregory's Minster pages are edited and written by S.A.J. Bradley (SAJBradley@aol.com) and maintained by Benedict Bradley (bbradley@live.dk).